Brilliant, theatrically vibrant arrangements of 25 of Woody Guthrie's classic songs, using Guthrie's ringing prose as context, sung in the tradition of the Almanac Singers, the Weavers, and Peter, Paul and Mary. 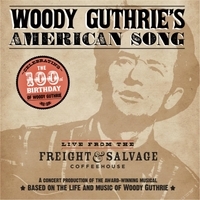 This double CD set, recorded at the famed Freight & Salvage Coffeehouse in Berkeley, California in 2012, captures the electricity of a live performance of this award winning musical theater piece, Woody Guthrie's American Song. The show, which premiered in 1988, uses Guthrie's own words to contextualize 25 of his songs, traveling with Woody from the Oklahoma of his boyhood, to the migrant camps of California in the late 1930s, and across the country all the way to a Bowery Bar in New York City in the 40s. The cast of 10 includes five singers - Lisa Asher, Berwick Haynes, Sam Misner, Matt Mueller, Megan Smith, and five musicians - Chuck Ervin, Robin Flower, Tony Marcus, Jeff Waxman, and Harry Yaglijian. Ranging from traditional bluegrass to folk to contemporary in sound, the show captures the glory of Woody's music. Also included are passages from his notebooks and letters. Taken together, this material makes it clear the Woody Guthrie was one of our most incisive, profound songwriters.